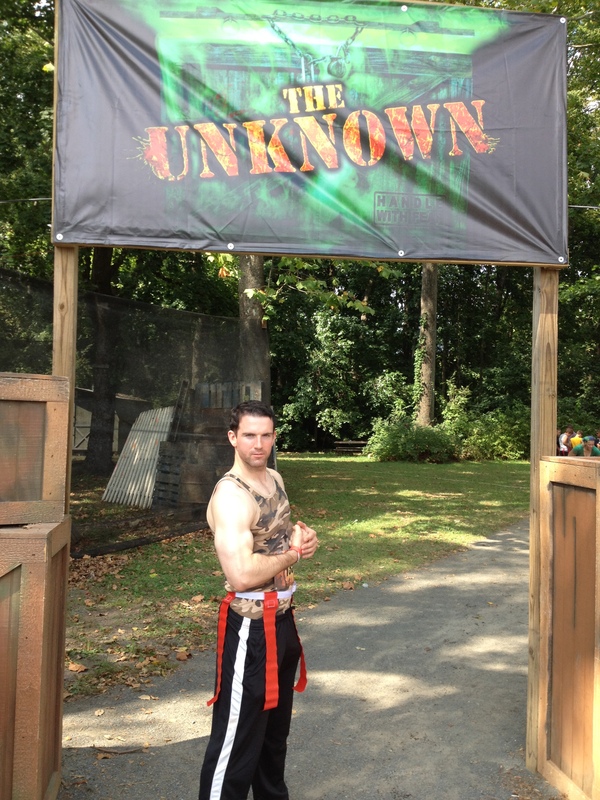 Me before running the zombie obstacle course. 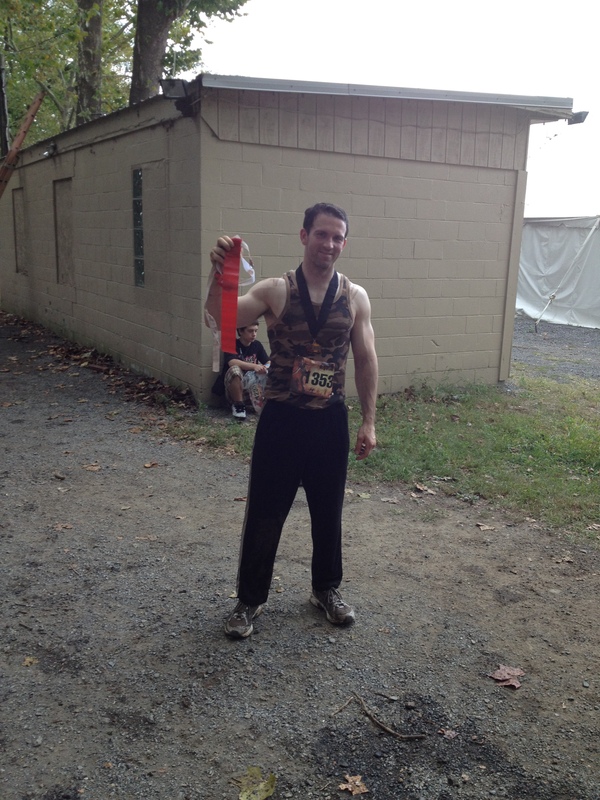 On Saturday I did the Zombie Mud Run in Sinking Springs Pennsylvania. All in all it was a fun experience. It was a 5K (3.1 mile) obstacle course with lots of mud and quite a few zombies we needed to avoid. Each runner started with 3 flags attached to their belt, in order to “survive” you needed to finish with at least one flag remaining. One of the bad parts about the zombie mud run were that it didn’t start on time. The person who was suppose to start the race didn’t show up at 2:30 when we were suppose to leave, so we had to wait roughly 15 minutes until they got someone else to start the run. The other bad part about the race was the fact that they let the zombies attack you and try to take your flags while on obstacles. This is stupid for so many reasons. One because IT IS DANGEROUS! It is bad enough you are climbing over a wall, sliding down a mud hill, jumping over a mud pit, but to do this while trying to avoid a zombie trying to steal your flag is just plain irresponsible. Two because IT ISN’T FAIR! I signed up to do this because it is fun. If I am climbing over an obstacle and have no choice of where I go, it isn’t fair for the zombie to wait for you where you are most vulnerable and can’t go any other way. I lost one of my flags while climbing down a ladder and the other flag while jumping over a pit onto a small platform where a zombie was waiting. I had NO choice but to go where the zombies where waiting and they didn’t even have to run to get me, they just had to wait and take my flag. I considered doing a different zombie obstacle course called run for your lives. The specifically have a rule that zombies can’t attack you while you are waiting for or on an obstacle. I decided to do the zombie mud run because there was a groupon that made it $40 rather than $77 for the run for your life. In hind sight I wish I had spent the extra money and did the run for your life run. Despite the fact that the zombies were unfair, the mud run was a lot of fun. There were lots of cool obstacles and when on flat ground it was a lot of fun dodging and running from the zombies. I have watched a lot of zombie movies and TV show but I have never before felt the terror of trying to dodge and run from a moving, running zombie. Another benefit was that the event was much smaller than other obstacle courses I have done. I was able to drive up and park right next to the starting line which made the event much easier logistically. When I did the tough mudder, we had to park very far away and walk 2.5 miles just to get to registration. I would highly recommend doing some sort of zombie obstacle course if you are the kind of person who like exciting activities and are an adrenaline junky. If possible go for the run for you life but zombie mud run is ok also, especially if you get a groupon discount. If you end up doing one of these sort of zombie obstacle courses then my recommendation is to bring a friend or a few friends who have similar cardio fitness level to you and run with them. I ran the whole course by myself. At the beginning everyone else slowed down a lot and waited for someone (me) to do the first few obstacles first because they were afraid that a zombie would jump out and steal their flag. I ended up getting further and further ahead of all the other runners as the race progressed. Every time I passed a zombie, I was the only one and I would have to get by the zombie with no distractions. The people who ran in a group had all the other people as distractions for the zombie. I ended up finishing the course in 26:47, a full 5 minutes and 43 seconds before the next group. Although I finished first by a wide margin, I survived with only 1 flag. If a fast buddy or two had run it with me I might have had more flags left at the end.